Gem's Up North : Topshop sale mini haul - Bargains!! 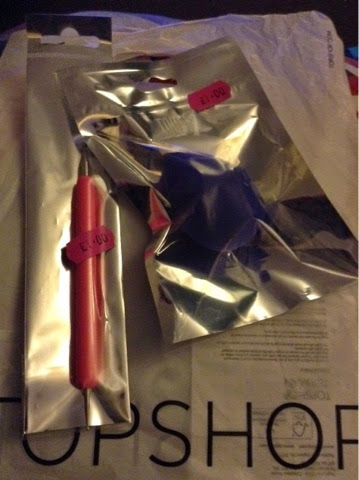 Topshop sale mini haul - Bargains!! Hey guys sorry it's been a while, Uni and work are basically taking over my life at the minute. Anyhow I was able to nip into town after work this morning and I ended up tooting around the sales... Topshop, River Island, New Look and Debenhams + more all have sales on, get bargain hunting people! 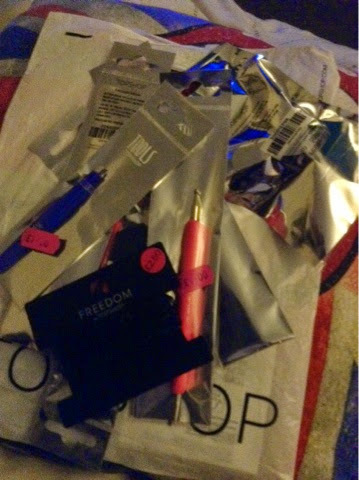 Topshop was a big hit today but not for clothes and shoes like normal but for make up accessories and jewellery, my total bill for 9 items was £8.10 so do you want to know what I brought... Read on! Bundle photo arghhh the bargains!!! 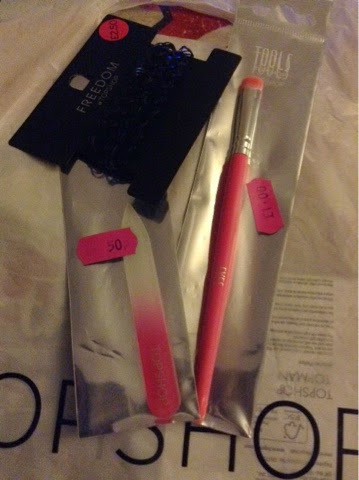 Next up 3 items that was originally priced at £5.00, a 'glass nail file', 'smudger brush' and 2x 90's style bracelets. The bracelets was the dearest reduced item but they are good quality unlike some of the ones on eBay and I have a necklace that will match the black one. The other bracelet was a blue colour, these was reduced to £2.50. I got 2 of the glass nail files and gave one to my mum, I wanted a small file to keep in my handbag and I have found that glass files are good quality and last a long time too so at 50p you can't go wrong! Eye shadow brushes are something that I am always after as I use a lot of different colour eyeshadows, these smudger brushes are great for the smokey eye look. This was reduced to just £1.00. 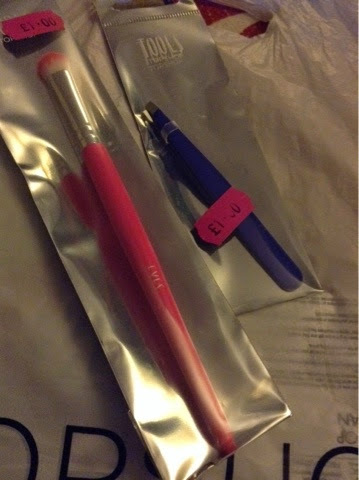 Two more items that was both reduced to £1.00 but had been more expensive at £4.00 are another eye shadow brush and some tweezers. You can never have too many eye shadow brushes haha. 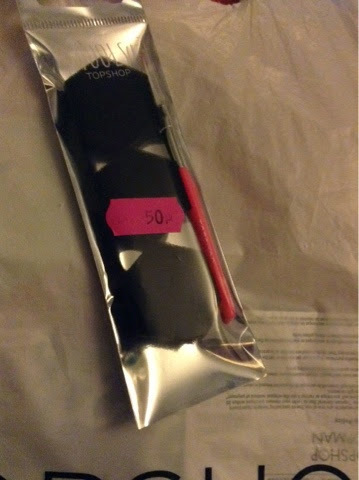 Tweezers was actually brought for a friends birthday box that I'm putting together for her. Lastly is the cheapest item of the day before being reduced which is a 'nail art kit' priced at £2.50 originally. I wasn't quite sure what this kit included at first but looking closer its like a nail brush that will paint lines and patterns onto your nails, should be useful after some practise. There's also 3 small black sponges included which I'm not sure what to do with, if anyone knows please let me know in the comments. Anyway this pack was reduced to just 50p so I brought it anyway! Overall if I had purchased all of these items at full price it would of cost me £42.50!!! Today they came to just £9.00 then I got student discount on top of this which made the total £8.10 (10% discount). Definitely my bargain of the month! 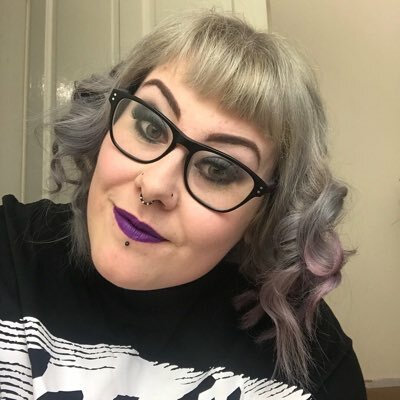 I have also made 2 online orders over the weekend from Urban Outfitters and ASOS, all are sale items so il try to publish a short post on them when they arrive, which should be this week, Yay! Ketchup PS I hope you have all been Zombie shopping for Halloween!